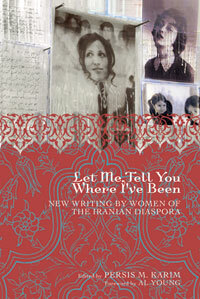 By educating a people who, due to the complicated U.S.-Iran relationship, have misjudged the Iranian woman as complacently veiled in her role in society, this book proves the basic and universal human need for acceptance, expression, and love. In a world where the West and Middle East seem constantly in conflict, Let Me, Tell You Where I’ve Been tips the scales towards acceptance and connects two disparate cultures. desperate to be heard. Through stories, memoirs, poems, prose poems, and essays, women of the Iranian diaspora tell of their displacement and the struggle to save their identity. Uprooted and misunderstood, these immigrants relate their experiences in the United States. The tales of the people fleeing to the land of opportunity only to find a land of prejudice are heartbreaking. However, the tone of the book remains optimistic. It gives the reader hope that, in a world where power is the driving force and wars determine existence, life continues and cultures survive, even thrive.